The Cathedral of Nature is the retreat of the ascended master Kuthumi. 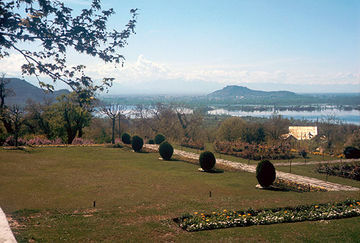 It is found just above Dal Lake in Srinagar, Kashmir. The physical focus of the etheric retreat is in the beautiful gardens that grace the environs of the lake. 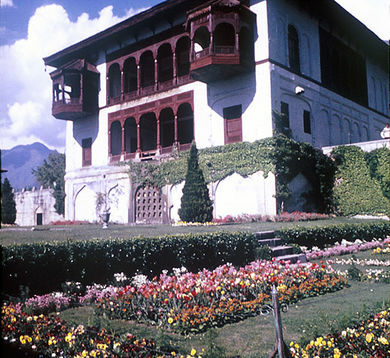 These gardens were designed and executed under the direction of Kuthumi in his embodiment as Shah Jahan, the emperor who also built the Taj Mahal in Agra between 1632–1650. In one of the gardens is a house that is said to be the birthplace of Kuthumi in his last embodiment. Nearby there is another house with a spring of pure water, said to heal many forms of incurable diseases. Pilgrims come from all over to partake of the waters of this spring. 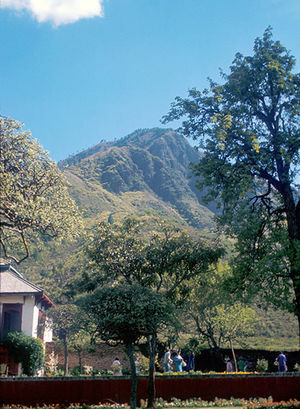 Behind the gardens is a mountain, the physical anchoring point for the etheric retreat of beloved Kuthumi, whose flame of illumined peace can be felt throughout the region. The massive center hall of the retreat is built of a substance resembling marble, combined with sparkling white stones. The giant dome over the hall is composed of the same material. Marble benches form a circular pattern around the center of the room, while on the periphery, they are perpendicular to the sides in a ray-like pattern. The benches are at some distance from one another, leaving room for the masters to gather a group of their disciples around each of these benches. The colors of the causal body are introduced into this great white hall in the cushions on the seats of the benches; the masters and their disciples wear golden robes, being of the Order of the Brothers of the Golden Robe. Twenty-four-hours a day, groups of disciples with their teacher gather in this great hall. At intervals during each twelve-hour cycle, either the Lord of the World, the Representative of the Cosmic Christ, or one of the World Teachers enters the hall and stands on the raised dais in the center to address the masters and their disciples. On the occasion when one of the aforementioned masters gives a discourse, the smaller groups unite into one large group facing the center. Adjacent to the great white hall is a flame room where the focus of the flame of illumination is guarded. Here the Brothers of the Golden Robe come and sit in the lotus posture to meditate, to pray and to expand the action of the flame on behalf of their brothers and sisters both in and out of embodiment. Other buildings form a part of the complex of this retreat, including libraries containing scrolls of wisdom, guarded by the angels of illumination. In these buildings, the usual functions of a retreat are carried on by the administrators under the hierarch. These include the programming of education for the entire planet and the enlisting of souls, either in embodiment or who are preparing for embodiment, to study these plans and then go forth to implement them in the world of form. I am known as a master of peace, but I prefer to be called simply a Brother of the Golden Robe. That holy order, which was founded long ago by one who saw true knowledge as the peace that passeth understanding, still functions today; and we count among our band ascended ones who have espoused the golden flame of illumination as a means of imparting peace to mankind as well as those unascended brothers and sisters who desire to become the peaceful presence of His wisdom to all mankind. If you would attend our University of the Spirit to learn the way to teach men how to pray, then I say, Call to me and ask the angelic hosts to accompany you to my retreat in Kashmir. And we shall receive you here to hear the Word—not mine alone, but of the masters of the Himalayas, who have outlined a course of instruction for the teachers of the race. ↑ Kuthumi, “The Opening of the Temple Doors II,” Pearls of Wisdom, vol. 16, no. 11, March 18, 1973.